Map by The Daily Yonder; lick on the image to view a larger version; click here to view the interactive version. In the first year of President Trump's tenure, the job trend of recent years continued, with job gains mainly in large cities. Almost 70 percent of the nearly 2.3 million jobs gained in the U.S. in 2017 went to metropolitan areas of more than 1 million people. "Rural America gained 154,000 jobs, but that wasn’t enough to keep up with the urban centers," Bill Bishop reports for The Daily Yonder. "Rural America had about 13 percent of the nation’s jobs in January 2017, but garnered only 6.8 percent of the jobs added during last year. Job growth was considerably stronger in rural counties that were adjacent to metro areas. 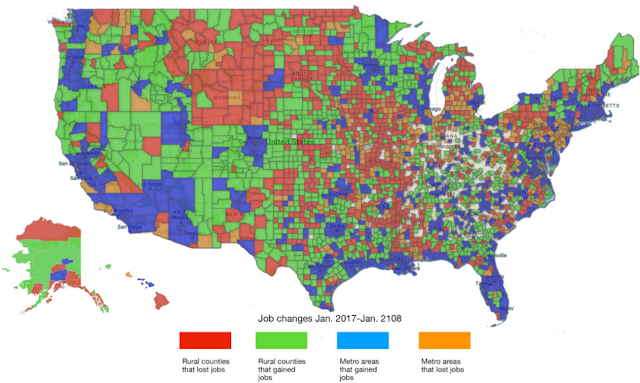 Those counties gained 121,000 jobs. Rural counties that weren’t adjacent to metro areas gained just 33,000 jobs." Meanwhile, the size of the workforce in rural America declined by 40,000 in 2017. Click here to see the Yonder's interactive map with employment stats on every county in the U.S.